Rotary dryers are commonly used in the minerals industry to dry a range of commodities including clay, gypsum, kaolin, limestone, mineral sand, potash and silica sand. Our company offers industrial rotary dryers. They consist of a relatively long cylindrical shell, which ranges from 0. 6 to 5 m in diameter and from 5 to 30 m long and is supported by two riding rings running on a set of rollers (rotation speed up to 25 rpm). They are slightly inclined from the horizontal; the slope enables material to move from the feed to the discharge end under gravity. They are suitable for a wide range of materials with varying size and composition. The feed rate ranges from less than 1 tonne to 500 tonnes per hour. Internal lifters, or flights, are used to lift, distribute and transport the material. This produces a shower, or cascade, of wet feed material through the hot gas stream, which promotes evaporation of the moisture and breaks up lumps to produce a more uniformly dried material. The hot air is introduced either at the feed end such that it moves in the same direction as the material (co-current) or at the discharge end such that it moves in the opposite direction (counter-current). 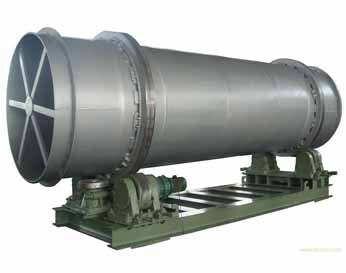 The co-current direct-heat rotary dryer is the most common, wet material is in contact with the hot gas stream as its highest temperature, which causes rapid evaporation of surface moisture. As it progresses through the dryer, heat energy is lost to the material it is drying and it leaves the dryer at a comparatively low temperature. In co-current dryers, the initial heat transfer is high, which causes a considerable drop in temperature thus preventing overheating of the material and the dryer itself. The final dried product is discharged with the gas stream at its lowest temperature, which ensures the moisture content can be readily controlled. Counter current dryers are more suitable for material that must be dried to very low moisture contents or where the last traces of moisture are difficult to remove.